Barcelona's superstar Lionel Messi added another record to his stellar career as he became the first player to score 400 goals in Spain's top football league 'La Liga', Anadolu Agency reports. On Sunday night, Barcelona won against Eibar 3-0 in the league match as Messi scored one goal, which was his 400th league goal. Messi, 31, has been playing for Barcelona since 2004-2005 football season and played in 435 league matches, scoring a total of 400 goals. The Argentine forward is the all-time top scorer of La Liga. Barcelona paid tribute to their team captain on club website. "Leo Messi just can’t stop stop breaking records. His 53rd minute goal in Sunday’s 3-0 win over Eibar at the Camp Nou was his four hundredth in La Liga. He’s achieved that in 435 matches, at an incredible average of 0.92 goals per game," Barcelona said. In this category Messi is followed by Portuguese star Cristiano Ronaldo, who currently plays for Italian giants Juventus. While playing for Barcelona's fierce rivals Real Madrid, Ronaldo scored 311 league goals in 292 appearances. Ronaldo, 33, was a Real Madrid player from July 2009 to 2018 summer. 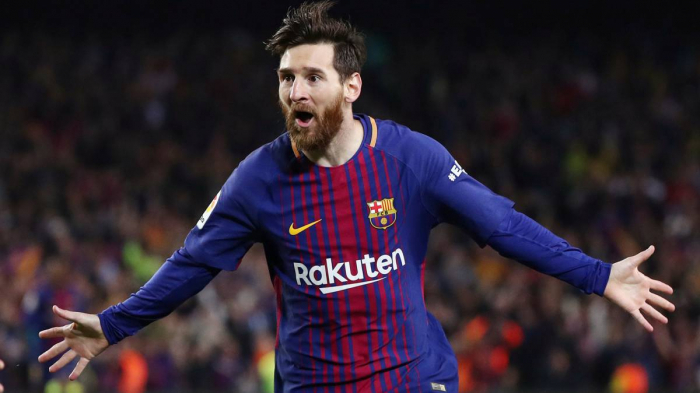 Since his debut for Barcelona in 2004, Messi tallied 575 goals for this club in all appearances including the UEFA Champions League, where he scored 106 goals. This season Messi is La Liga's top scorer with 17 goals. He is chased by another Barcelona star Luis Suarez producing 14 league goals. Separately Barcelona are leading the league as they have 43 points. The other title contenders Atletico Madrid are in the second spot. "Atleti" has 38 points in 19 league matches.